Credit: eBayOlive Garden Never Ending Pasta Passes for sale on eBay. In the wake of Olive Garden's highly successful promotion for never-ending pasta, the Italian chain faces what might be called a high-quality problem. 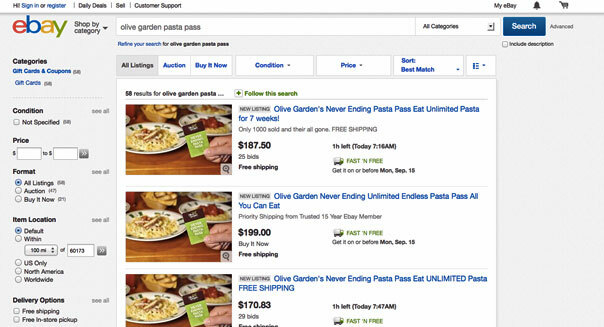 More than 50 of the 1,000 pasta passes are drawing bids on online auction site eBay (EBAY) for multiples of the original $100 purchase price even though the restaurant stipulates on its site that they are "non-transferable and may not be re-sold." In light of this, the company faces a dilemma: it can either enforce the fine print and risk making some second-hand buyers or sellers mad, or bend the rules and not risk alienating customers. So far, the company has chosen the first path. "We're working with eBay to notify both buyers and sellers that the Never Ending Pasta Passes are non-transferable and may not be resold," said Tara Gray, a Darden (DRI) spokeswoman, by email. On Monday, the pass promotion drew half a million visitors within the first half hour. At times, the volume was so great, the promotion's site suffered technical glitches. At least one seller has been transparent about the potential issue that buyers face. User rpskoolinu, who listed two passes for $500, wrote "If the cards are marked with our name and not able to be used, I will issue a full refund. I don't know if they simply have to state the non-transferable for legal reasons or if they will implement." Many of the other listings for the pass fail to mention that they can't be re-sold. One eBay reseller that CNBC emailed planned to get around the reselling ban by leaving one of the fields for a name for the pass blank. "Yeah I don't know exactly. There isn't a name on the card. There is just my billing info. I can always tell them I bought it for the person who got it on ebay. How are they going to tell me I didn't?" he wrote in a message. For those who failed to snag a pasta pass Monday, Gray mentioned the company will be hosting giveaways during the next couple weeks leading up to the beginning of the promotion.